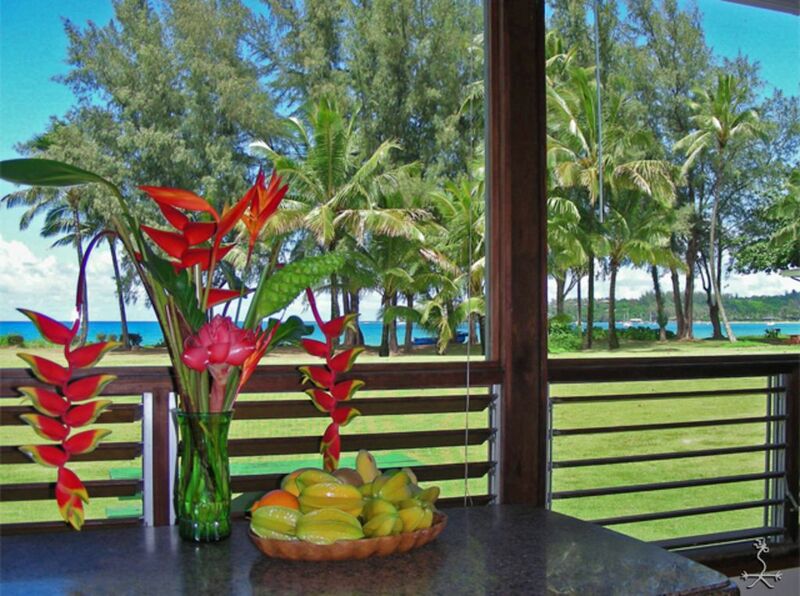 Hanalei Moon Beach Cottage is located in the middle of Hanalei Bay. The Cottage is named after the famous Hawaiian song 'Hanalei Moon,' which extols the extreme beauty and romance of the Hanalei Valley under the tropical night sky. The cottage is located on the quiet end of town on Weke Road, only grass between you and the sand, on 1/3 acre within walking distance of all the restaurants, shops and galleries. Waterfalls are the backdrop for our little beach house. There is a complete cozy kitchen where you can whip up fabulous food from the Hanalei Fish Market, the Farmer's Market, or just make snacks to go and eat out every night in one of the great local restaurants. A Chinese lemon tree is just outside your bedroom window for drinks or pies. The bedroom has a king size bed and lights for reading at night & a flat screen TV. It has a separate bathroom entrance. We have a little telescope in the living room so that you can better see boats, whales, and dolphins ply the Bay by day and enjoy the moon and stars at night. In the summer you will see boats, stand up paddlers kite surfers, and all manner of ocean craft right from your living room and the adjoining covered lanai. In the winter you will see surfers. If you're lucky, you may see a moon bow, something I have only seen in Hanalei. It will happen on a night when there are stars, moon and clouds together. If the clouds are sailing by on the gentle trade winds and shedding some tears, the rain will be illuminated by the moon shining from the cloudless part of the sky. Talk about breathtaking! Depending on the brightness of the moon, you may discern the colors of the rainbow. Snorkeling, swimming, diving, paddling, hiking, golfing and a health club are all as close as your front yard, to as far as a 10 minute drive away. Walk across your front yard and look to the left; you're likely to see no one for a mile. Look to the right and you'll probably see surfers, volley ball players and beach-goers, with the Hanalei Pier at the far end of the Bay in the background. There is a neat outside hot & cold shower for after the beach or under the stars and a washer & dryer on the side of the house. Airy bathroom with a small but efficient shower. Just outside the back door is a large open air shower with hot and cold water with privacy created by plants and a bamboo fence. Peak at the ocean and stars while you shower! Large lawn between your house and the sand. Watch the surf from the house. Most all the Hanalei Mountains and waterfalls are visible from the yard. Off street next to house. Ocean view with flat screen. Round table seat 4 with an ocean view. Table on deck seats two. Nice covered deck for dining and relaxing.